This year we have decided to introduce ‘House t-shirts’ for P.E and Games lessons. These will give the children further pride in the houses that they represent and earn ‘Tocyn ty’ tokens for. There are four houses represented in the school named after Welsh counties. These are Dyfed, Gwent, Gwynedd and Powys. The house system plays a very important role in school and children earn rewards for their houses and it brings a fun competitive element to the children’s learning. As a school we have bought every child their first house t-shirt and we hope that they enjoy having them and wearing them for sports activities in school. We would like the children to wear their house t-shirts as their kit for PE and Games lessons. It may be easier to leave a bag in school with the t-shirt and some/shorts or tracksuit bottoms so your child always has their kit in school. 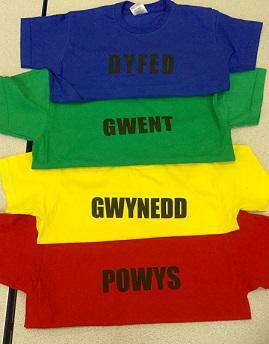 The house t-shirts can also be worn at House events like the Eisteddfod, Sports day and other games/sports competitions. When you child has outgrown their t-shirt reasonably priced replacements will be available from the school.